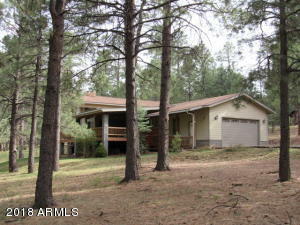 Backing to the Sitgreaves National Forest, this is a great place to get away from the heat of the city. This beautiful cabin has been meticulously renovated recently, including hand crafted custom cabinets, granite slab counters, new appliances and a farmers sink. The great room cabin plan has dramatic vaulted ceilings, lots of wood and a pellet fireplace that will heat the cabin on the chilliest night! 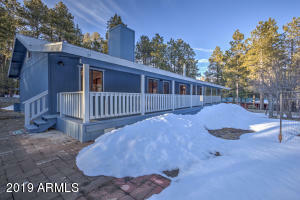 Great views of the surrounding Ponderosa Pine Forest from every window. Plenty of room for all your toys in the nearly new detached garage and carport. Garage doors on both ends so you can pull your SUV in and park inside, then drive your Side by Side out the front. Plenty of extra storage in the jumbo detached shed. Plus, a treehouse for your mother-in-law—or the kids! There’s even a zip line so mom can pop in for breakfast. 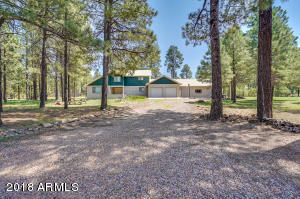 The cottage is nestled into a stand of mature Ponderosa Pines with great views from the large front and back covered decks. Everything here is special but the best of all might just be the National Forest behind the cabin site! 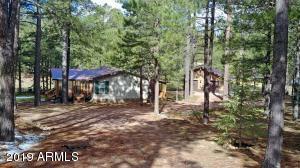 You’ll share a 250’ border with the Sitgreaves National Forest here. Lush ferns and prairie grass meanders through the majestic towering pines. Deer and elk are frequent visitors. 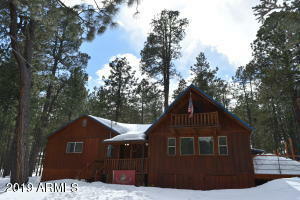 Forest Lakes sits atop Arizona’s Mogollon Rim at an elevation of about 7600 feet above sea level. Temperatures are 30- 60 degrees cooler than the Valley. It is only a two-hour scenic drive from most areas of Phoenix. There are approximately 950 – 1-acre cabin sites in Forest Lakes, about 850 of those are North of Highway 260 and less than 100 on the south side of the highway.